Recent deepwater discoveries and projects in the Sabah region in Malaysia have shown that the potential for increased national oil and gas production from such fields is considerable. With deepwater oil and gas estimated to account for the majority of the country’s undiscovered reserves, the development of deepwater and subsea sectors is becoming increasingly important to mainland Malaysia’s domestic supply and position as a regional crude oil and LNG exporter. In a bid to drive the country forward as the deepwater hub for the Asia Pacific region, Malaysia’s National Oil Company, PETRONAS, in collaboration with international operators, are now investing in the latest deepwater and subsea expertise and technology to develop these challenging fields. The SUBSEA Asia conference, taking place on Wednesday 3rd October 2012, will be the seventh technical programme run in Malaysia by the industry leading association, Subsea UK. The technical conference addresses the issues and challenges facing the region’s subsea and deepwater professionals and attracts the major industry players to discuss the latest development in knowledge and technology from within the industry. Running every year since 2006, the SUBSEA Asia Conference has drawn speakers and delegates from South East Asia and beyond with presentation from Aker Kvaerner, Cameron, FMC, Petronas, Shell, Subsea 7, Schlumberger Subsea Surveillance and Technip amongst many others. As demand within the Malaysian oil and gas industry for deepwater exploration increases, SUBSEA Asia cements its position as the leading sales platform for technology suppliers looking to capitalise in this expanding sector. Over 130 companies from 19 countries exhibited at SUBSEA Asia 2010. This was an amazing 100% growth on the 2008 event and reinforces the exhibition’s importance in this vital sector of Malaysia’s oil and gas industry. The SUBSEA Asia 2012 exhibition will take place alongside the conference, opening for a reception on the evening of Wednesday 3rd October. It will then be opne for two full days on the 4th and 5th October. Demand for space is already gaining momentum and we encourage all exhibitors to make their bookings early to avoid disappointment. 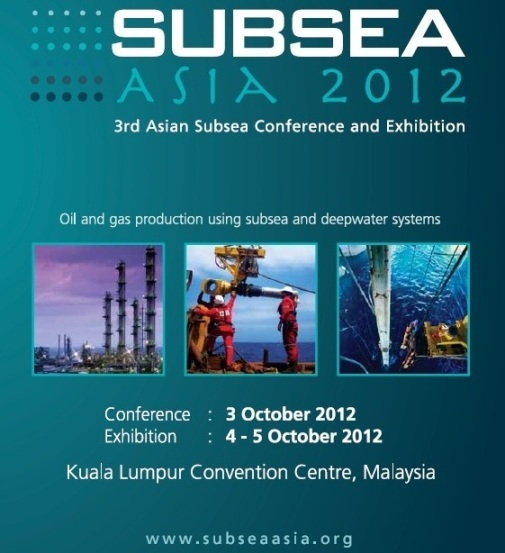 A diverse collection of subsea technology, services and equipments will be on display at SUBSEA Asia 2012.